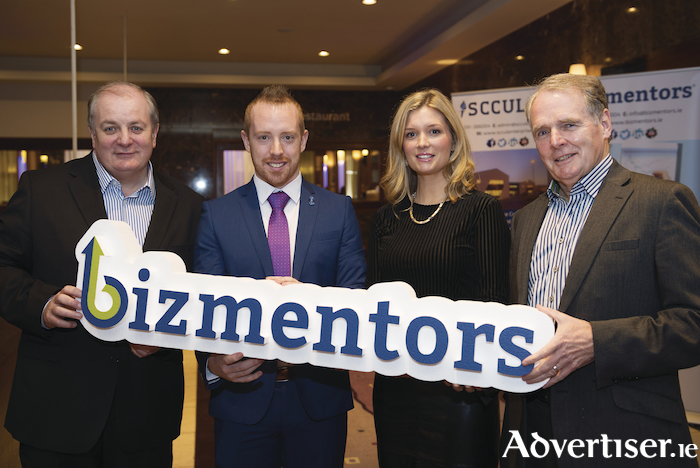 Pictured from left are Gavin Duffy, Michael Smyth, GM of SCCUL Enterprises CLG, Dr. Johanna Clancy, Chairperson of SCCUL Enterprises CLG, and Colman Collins, Chairperson of the bizmentors Advisory Board. bizmentors marked another significant milestone last week as it welcomed the 900th person to its free mentoring programme. Since its inception in 2012, bizmentors has supported start-ups, SMEs and social enterprises throughout Galway. There are over 100 experienced mentors on the bizmentors panel. The mentors have expertise across a wide range of disciplines including marketing, sales, finance, business planning, it and legal. While the latest milestone is a welcome achievement, bizmentors® has its sights firmly set on the future. Announcing the programme of events for the next year Chairman of the bizmentors Advisory Board, Colman Collins, said “bizmentors has provided access for local companies to experienced business expertise and wisdom.